6900 NF 1958 Leyland Firemaster. Originally Manchester Fire Brigade. Built on the Leyland Worldmaster coach chassis only 10 ever built. John - For many years we thought there were only 10 of these, and then we found an eleventh, a left hand drive version that went to Kuwait. Added by Ian Moore on 06 April 2012. Just a question about the registration, is 'NF' a prefix that was used just in the Manchester area? Added by Matt Ireland on 06 April 2012. Added by Barrie Green on 06 April 2012. I would love to this restored and on the run around the rallies, the last owner used to show it some years sgo. I have met the present owner and he intends to use it as it is. He has done some work on it. After he purchased it he fitted new batteries and it started straight away and had it drove to its present location. I remember them on the run as as a lad in Manchester. If only I could get those numbers up on the Lottery !!!! Added by Paul Warnock on 13 April 2012. I agree entirely. My Dad was a Sub Officer in The Manchester Fire Brigade and I remember him telling me about the new appliances (Leyland Firemasters) that had been aquired. He rated them very highly. Manchester FB also had a Leyland Firemaster Emergency Tender and I recall Dad telling me that the vehicle was a tight squeeze through the turnout gates at London Road Station. In fact it had to be fitted with 2 smaller Blue Beacons instead of the single larger unit that the Pump Escapes had been fitted with. This was due to its height. Magic machines. Sadly the Emergency Tender was aquired by a group of travellers who did a bizarre paint job on it before it was finally written off in a RTA. Added by Barrie Macdonald on 18 June 2013. 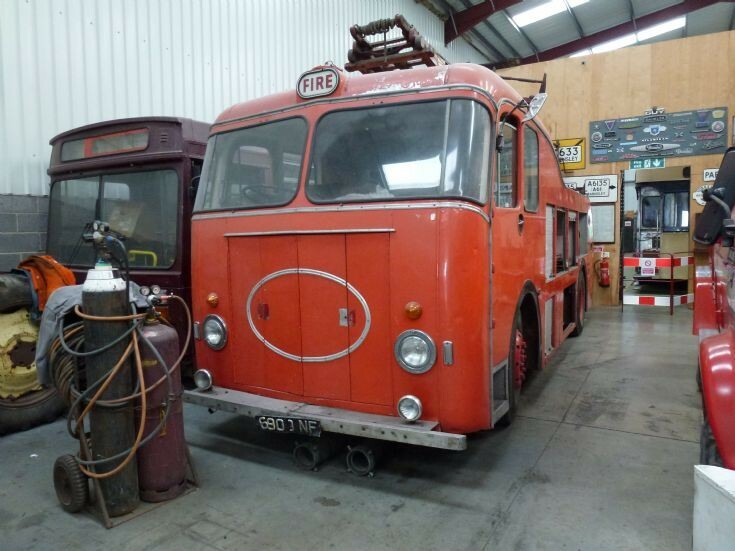 I visited the South Yorkshire transport museum at the weekend, work is on going by the present owner to restore this appliance with a fair amount of work being carried out. I look forward to seeing out and about. Thanks for the information Barrie, I remember the Leyland ET at London Road when on the run, there is a picture of it in its after life on the internet. Added by Paul Warnock on 19 June 2013. Added by Grant Melville on 19 June 2013. Hi Grant.... The last appliance aquired during my Dads time at London Rd; was a Simon Snorkle which was, as I am aware, one of the first Hydaulic Platforms to be operational in the country. I wasn't aware of a Firemaster TL in MFB so thanks for the update. I would be interested in obtaining the DvD that you refer to, if you could provide some more detail Grant, that would be magic. One of my proudest moments was at a London Rd annual open day and Display. 2 Turntable Ladders were extended to maximum height and positioned so close as to enable the two guys at the head of each ladder to shake hands. One of these guys was my Dad, I would be about 10 years old. Some memoriesw never leave you. Added by Barrie Macdonald on 19 June 2013. Barrie the footage of the TL was filmed comming out a different station plus alongside the ET at that (or another Station getting extended). The DvD came out as a boxset with VFG1&2 and The Roaring Seventies in 2007 after VFG3 that year. There hasen't been another one since? So I don't know if the company does exist? The address on the VFG3 DvD is Voyager Film and Video Unit 21, Brockholes Buisness Park Holmfirth HD9 7BN. You may get VFG2 still on video? Good Luck in your search Grant. Added by Barrie Green on 19 June 2013. Manchester never had a Firemaster TL Wolverhapton and Darlington had the only two examples built. Manchester had a Firemaster ET. Added by Andrew Middleton on 19 June 2013. Hi.... could I share a memory of mine based on an actual event that Dad told me about which probably involved a Leyland Firemaster from London Rd Station. Dad was Oi/C of the second pump out of London Rd attending Crown Wallpapers in Blackley Manchester. The 1st pump was provided by a more local Station, probably Ash St. This factory had a long history of false alarms caused by an over sensitive fire detection system. Whilst on route to Crown Wallpaper Dad heard a 'check address' radio message indicating London Rd's 1st pump going 'mobile' to a house fire in Harpurhey. This was quickley updated to 'persons reported' status. Knowing he was only seconds away from the house fire, he radio'd in to control asking to be allowed to divert to the house incident. HQ Control hesitated for a few seconds before re-directing him accordingly. On arrival the house was found to be well alight needing 2 medium jets to subdue the conflagration and allow 2 BA men to search the premises. It was later found that the occupants had escaped through a back bedroom window. Next day my Dad was called before a Senior Officer and reprimanded for his actions. He always maintained he broke the rules for all the right reasons...... and would do the same again under the circumstances. Added by Barrie Macdonald on 10 January 2014. Good for him, Barrie! The first duty of any fire service member is to protect human life at risk, and this is universally true all over the World. Added by Rob Johnson on 10 January 2014. If control re-directed him, what did he do that was wrong? If control had been on the ball, they would have sent him before he requested to go in my opinion. Added by Bristol Bob on 10 January 2014. I understand that 6900 NF has been sold again....no other information as yet. Added by Barrie Green on 10 January 2014. Very interesting Barrie, I wonder what would have been said had your Dad carried on to the AFA and somebodies life was lost in the house fire. I can Imagine what the media would have said knowing an appliance had passed close to an actual fire and not checked it. A similar incident happened to me a number of years ago. We were experiencing a very bad thunder storm with pumps flying about from job to job. I was OIC of a pump and sent to an AFA, whilst on route control contacted another pump ordering them to report of a house struck by lightening, we were about 2 or 3 minutes away, I contacted control and told them we were passing this road and should we attend, they sent me to this house struck by lightening, as soon as we turned in to the road we could see the fire through the roof. This ended up a make pumps 4 as both semi detached properties were involved. I got a pat on the back for a quick attendance. Added by Paul Warnock on 10 January 2014. And the AFA Paul......did it turn out to be a Micky ? Added by Barrie Green on 11 January 2014. Barrie - I don't know about this one, but I do know from numerous reports that fire services in many different countries typically report that only one to three in a hundred AFAs are actual fires. No wonder that many of them send only a minor alarm unit with two or three members or at most a single pumper to such alarms. Added by Rob Johnson on 13 January 2014. Hi Barrie, the AFA turned out to be caused by the adverse weather, thunder and lightening. No actual fire. Added by Paul Warnock on 13 January 2014. My memory of this fire engine was when it knocked me off my bike on Rochdale Road in about 1964 ! I would love to see it at a vintage vehicle rally sometime. Added by Graham Daniel on 18 August 2015. This appliance has moved from the South Yorkshire transport Museum. It has been sold by the owner. Its whereabouts at the moment are unknown. Added by Paul Warnock on 20 August 2015. The Firemaster 6900 NF is now at the GMFS Museum in Rochdale. It is being slowly but surely restored to its former glory. Added by Barrie Macdonald on 04 March 2017. I live near the GMFS Museum , and can confirm that NF6900 is being subjected to a restoration by Bob Bonner and his team. They are a dedicated and truly professional bunch of guys. Added by Barrie Macdonald on 08 July 2018. These Firemasters are an important bit of history, even if they were not generally well accepted and barely made a dent in the business of building custom fire appliance chassis. I clearly remember when Darlington's Firemaster Magirus ladder first appeared at the old Borough Road fire station in 1960, especially as it was one of the first fire appliances to have blue beacon lights. It looked nothing like the 1938 Dennis Morris Magirus it replaced! Added by Rob Johnson on 10 July 2018. Am I right in saying 6900NF was bodied by Cocker of Southport? They also bodied the Leyland (ergonomic) Cocker at St Helens elsewhere on this site. Added by Petros on 05 November 2018. Added by Paul Warnock on 07 November 2018. These had a two door cab, with the OIC's seat moved to the center and two side facing bench seats behind for the other crew members, with room for two on each side. This way, everybody except the driver had to use this single door. This was perhaps a concession to its origins as a bus chassis with an underfloor mid engine configuration. The ET and the Essex PESTs had the same layout, but of course the center aisle design also meant that crew members could enter and exit through the rear doors too. Added by Barrie Green on 15 November 2018.